Since scoring big on the housing crash, fund manager John Paulson has had some high-profile struggles. If you're an investing wonk that loves lessons in investing process or behavioral finance, billionaire hedge-fund manager John Paulson is utterly captivating. Of course, if you're a fan of schadenfreude or are on a warpath against the "one percent" he's also interesting -- but those are stories for another place. It's a bit of ego on his part -- 'I made billions of dollars and did this big trade and I'm a genius,' ... That hubris leads him to make big bets and unfortunately most of them have gone wrong. All signs point to the view that Paulson had been a very competent and successful manager of an event-driven / arbitrage hedge fund. That is, a fund that bet on specific catalysts, corporate events, and mergers. Then came the housing run-up. Paulson bet big on the housing bust. And Pauslon bet correctly. The result was billions to the fund's investors and billions to Paulson himself. After that, it seems Paulson suddenly fancied his fund a macro-oriented fund and started to construct big-picture bets. In mid-2009, he began building an outsized position in big banks -- including billion-dollar-plus positions in Bank of America (NYSE:BAC) and Citigroup (NYSE:C) -- on the view that the banks would turn on the post-recession recovery. If the bet wasn't a disaster, it was something very close. 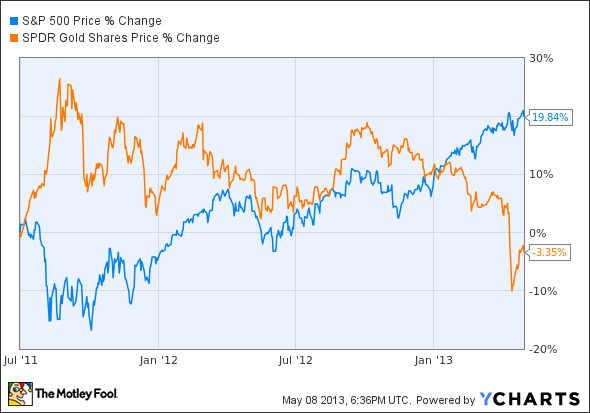 As the S&P 500 (SNPINDEX:^GSPC) recovered, the stocks of both B of A and Citi crumpled. By December 2011, he'd zeroed out the positions. And in a sad coda to that trade, both stocks turned around and solidly outperformed the S&P between when he sold and today. 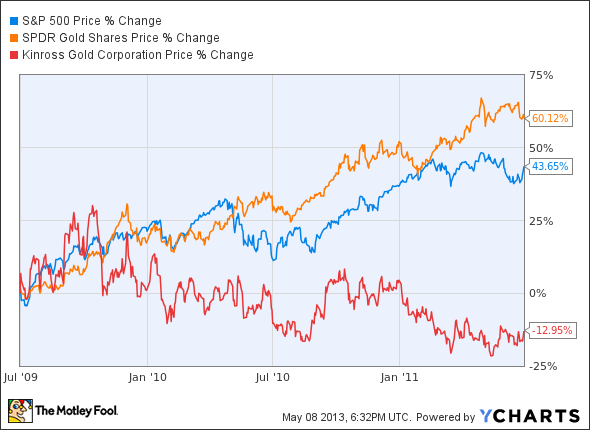 Around the same time, he also started building a large position on gold and gold-related investments. According to S&P's Capital IQ, by March 2009, the Paulson family of funds already had nearly $3 billion in the SPDR Gold Trust (NYSEMKT:GLD). That was accompanied by smaller stakes in Market Vectors Gold Miners ETF (NYSEMKT:GDX), Kinross Gold, and Gold Fields -- among others. The gold mining companies -- Kinross in particular -- didn't exactly shoot the lights out. But the overall view -- that gold would continue powering higher -- worked quite well. That is, it worked quite well until it didn't. 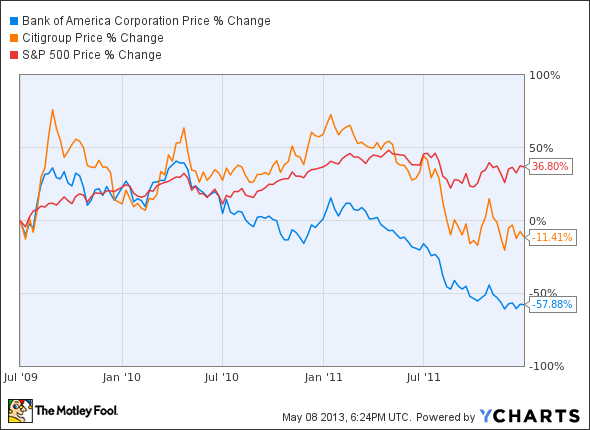 Starting around mid-2011, gold started to shudder, and the gravy train slowed markedly. It slowed enough that it's significantly lagged market indices over the past few years, leaving Paulson-fund investors in the lurch. That leaves Paulson today with substantially less of a "master of the universe" reputation than he had coming off his outlandish housing-crash win. Looking ahead, the real story will be whether Paulson can successfully turn things around. My take is that the turnaround won't come via a sudden insight into the macro-investing game that will lead to another big-bet win. Instead, it would more likely come from a realization that his forte and alpha-producing potential lie in arbitrage investing, not big-picture bets. In the stock market, it can be mind-numbingly difficult to separate the true skill of an investor from dumb luck. I won't pretend to have insight into whether the housing bet was the latter or the former. But what does seem clear to me is that Paulson's skill seems to lie in the event-arb arena. Sure, it's a quieter backwater that isn't typically a media king maker, but for those that can do it well, it's a steady performer. To Paulson's credit, Bloomberg makes it sound as if the fund is gravitating back to that traditional strength. Since late 2012, Paulson has emphasized to clients his firm's strength in investments that aim to profit from takeovers, restructurings and spinoffs. The firm's new website, started last week, portrays Paulson & Co. as a bottom-up, event- driven arbitrage firm that seeks capital preservation and above- average returns, without mentioning gold. Individual may not think they have much in common with a big shot billionaire like Paulson, but his experience over the years since his big win suggest a lesson that we all can learn from. Process, outcome, skill, and luck play very big roles in investing. That something worked in the past doesn't mean it was the result of your brilliance, or that a similar approach will work in the future. On the other hand, a positive outcome that was the result of a well-honed process that relies on carefully selected inputs is far more likely to lead to the long-term results you're looking for.